Static single assignment analysis. 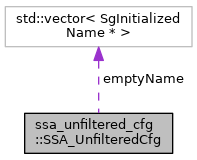 This analysis attaches uses an definitions to unfiltered CFG nodes rather than to AST nodes; as such its interfaces are more intuitive and easier to use. It also resolves some ambiguity issues when attaching definitions to AST nodes. Bodies of catch statements are not analyzed. This is a shortcoming of the ROSE virtual CFG, because these bodies do not appear in the virtual CFG. Variables used to define the dimensions inside an array declaration are not detected as uses. This is because the SgVarRef nodes for these variables are not visited by AST traversals. Operands of the sizeof operator are considered uses, and they should not be (relatively easy fix). Definition at line 81 of file ssaUnfilteredCfg.h. Returns the reaching definitions before the given node was executed. Get the final versions of all the variables at the end of the given function. A compound variable name as used by the variable renaming. Definition at line 90 of file ssaUnfilteredCfg.h. A map from each variable to its reaching definitions at the current node. Definition at line 95 of file ssaUnfilteredCfg.h. Print the CFG with any UniqueNames and Def/Use information visible. fileName The filename to save graph as. Filenames will be prepended. This will only print the nodes that are of interest to the filter function used by the def/use traversal. Returns the reaching definitions after the given node was executed. If there are no local defs at the node (i.e. getDefsAtNode returns empty), then the reaching defs After a node are identical to the reaching defs before the node. Returns the definitions that occur at the given node. Get the reaching definitions before the given AST node is executed. Get the reaching definitions after the given AST node is executed. Returns all the SgVarRef objects that are used in the execution of the given AST node. Given a use obtained through getUsesAtNode, resolve its corresponding def. Returns the entire use table, mapping each non-statement AST node to the variables used in its execution. Find if the given prefix is a prefix of the given name. This will return whether the given name has the given prefix inside it. name The name to search. prefix The prefix to search for. Whether or not the prefix is in this name. Get the uniqueName attribute for the given node. node Node to get the attribute from. Get the variable name of the given node. node The node to get the name for. The name, or empty name. If an expression evaluates to a reference of a variable, returns that variable. Handles casts, comma ops, address of ops, etc. For example, Given the expression (...., &a), this method would return the VarName for a. Get an AST fragment containing the appropriate varRefs and Dot/Arrow ops to access the given variable. var The variable to construct access for. scope The scope within which to construct the access. An expression that access the given variable in the given scope. Get a string representation of a varName. vec varName to get string for.